IRVING, Texas — NFL Vice President of Officiating Dean Blandino visited the Cowboys front office and coaching staff over the offseason, and now Cowboys chief operating officer Stephen Jones sees Dez Bryant’s apparent catch vs. the Green Bay Packers in last winter’s NFL playoffs differently. "You know, as it turns out, according to the rule, I think the call was correct," Jones said Tuesday at the grand opening of the Dallas Cowboys Club at Dallas/Fort Worth International Airport. The seeming go-ahead touchdown catch that was waived off after a thorough replay review speaked a heated controversy, especially since it helped knock the Cowboys from the postseason. The recent consensus with the Cowboys was built through "lengthy discussions," according to Blandino. "I came here to Dallas to and visited the coaching staff and had discussions with Coach Garrett and the rest of their staff," Blandino said last week at the annual officiating clinic in Irving. "And it was always positive. They may not agree with the call, but it was always positive. ‘Hey, look let’s get to some common ground as to what are we going to teach our players. How can we can consistent?’ "
Even though the two competition committee members are looking for consistency, Jones is also looking for a way to alter the rule so in the future such spectacular, athletic plays aren’t ineligible. "Now, going forward is there a better way that great plays that are made by great players like Dez Bryant or a Calvin Johnson, is there a way where you can tweak a rule to say, ‘Hey, those guys really caught those footballs and they should be catches under the NFL rules’? That’s the job of the competition committee and for us to continue to look for ways to get better." Blandino’s visit to Valley Ranch wasn’t typical for the VP of Officiating. Usually, Blandino sends one of his supervisors to the headquarters of each of the 32 teams. But for the Cowboys, he felt he needed to make a personal appearance. Why the Seahawks' call will live in infamy as the dumbest play-call in NFL history. "I wanted to make sure that I was in Dallas this year, because obviously it was a controversial play and I wanted to go through with the staff in person as opposed to having one of my supervisors do it," said Blandino. And it is that level of dedication that earns Blandino admiration in Jones and the Cowboys’ eyes. "I applaud everything that Dean’s done," Jones said. 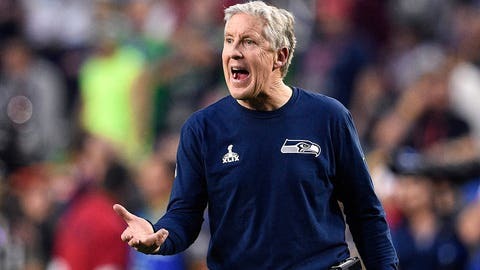 "I think he does a great job verbalizing, not only with the coaches and the players, but his officiating crews that he has out there on the field. And I think we’re lucky to have Dean."